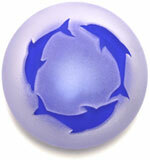 Companion Star transforms elegant artglass into beautiful, one-of-a-kind memorials. At your request, we will incorporate cremated remains visibly but discreetly within each custom-made work of art. Faithful Friends Crystal has responded to requests for designated Bird, Cat, Dog and Horse memorials by selecting several from our standard designs. However, you may choose any Companion Star to honor your cherished friend. You may also choose to memorialize any companion animal not included in our brief list of designated designs. Choose from solid or handblown designs. Each handblown design provides a hollow area within. This ensures a beautiful, safe haven for rings, years-of-service pins, and other cherished items. Add one or more Star Cluster™ collections to these memorials. Personalize further with carved standard or custom designs. Choose from a spectrum of styles and colors, including pendants, double-sided glass lockets, and jewels suitable for precious-metal settings. Pendants and lockets arrive in elegant presentation pouches. A variety of lightstages (pedestals) will underlight your memorial for night viewing. Several lightstages also serve as receptacles for cherished items. Several lightstages also provide a compartment for cherished items, or for additional cremated remains. All designs are available solely as works of art (without cremated remains). Also named The Dog Star, Sirius is the brightest star visible from Earth. It is part of the constellation Canis Major (The Big Dog). The solid three-sided pyramid surges with red, gold, black, white, and jewel-tone iridescence. a natural cherry pedestal [LSC] 7” h x 5” sq. which underlights the memorial for night viewing. This lightstage also provides a separate compartment for cherished items and/or cremated remains. Cat's Eye alludes to an ancient name for the group of stars between Antilia and Hydra, called Felis the Cat. A lightstage illuminates this sleek shape for night viewing. Aquila (The Eagle) was also known as Falco sylvestris (The Wood Falcon) in ancient times. 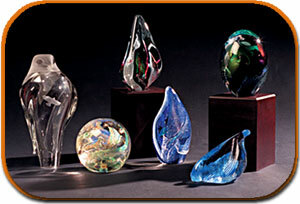 This hollow blown-glass design provides a display area for your cherished items. A carved flying eagle (shown) and three stars. Dynamic colors swirl in this solid oval design, replicating clouds in the HorseHead Nebula. Transparent rainbow iridescence races with a range of opaque greens and blues, while delicate strands of cobalt and black simulate wind streaming through mane and tail.